I was looking for something more summery to drink and I pulled out a bottle that I had purchased a couple years back when my cousin was visiting. We had gone down to Portland for a long weekend to visit my brother and his family and spend an afternoon wine tasting in the Willamette Valley. Walnut City Wineworks is located in McMinnville, Oregon, in a re-purposed walnut processing plant (hence the name of the winery). They share their space in a cooperative venture with Carlton Hill Vineyards, Bernard-Machado, Lundeen and Robinson Reserve. The Walnut City Wineworks 2012 Rosé is made from 100% Pinot Noir. It is a dark, pink salmon color, with a crisp, tart strawberry flavor. This Rosé has aged beautifully, maintaining a lot of structure over the last couple of years. It is certainly drinking well! This wine certainly hit the spot for an evening spent with Jon and a friend, and was delicious over the next couple of days as well. 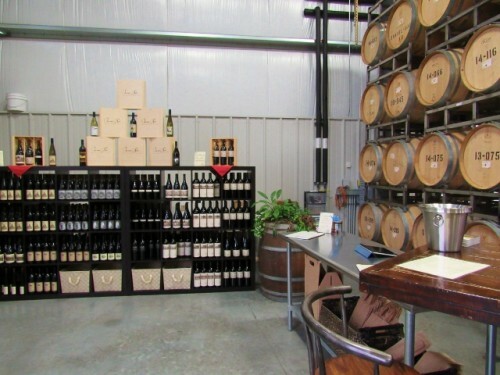 Have you tried any of the Walnut City Wineworks wines? What did you think? The last adventure on our Yakima weekend took us out near Toppenish, Washington, to the Toppenish National Wildlife Refuge. It is a bit of a drive from civilization, but certainly an easy one, with open roads and sparse traffic. 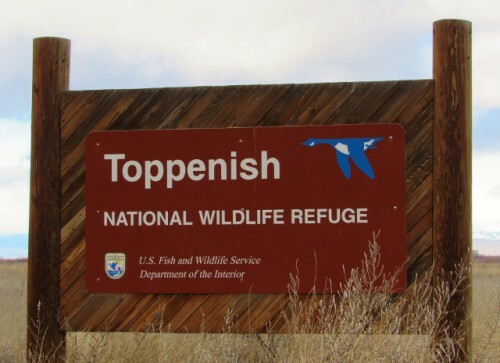 We went to the main section of the refuge, but Toppenish consists of several sections, all located along tributaries of the Yakima River. I was hoping to see lots of overwintering birds, but it was not to be. This refuge has a mowed walking trail through a grassy field, which then runs along the edge of a pond. If there were birds there, it would provide good access to view them. It is in Eastern Washington – so even though it was cold, it wasn’t raining (it had rained the day before though). We saw lots of deer poop and rabbit poop. I bet when it isn’t hunting season, they are all around (I never used to be this interested in poop.). The walking trail at this refuge is longer than many of the other refuges we have visited. 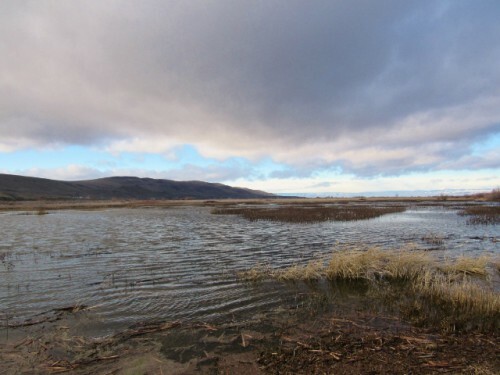 Toppenish NWR provides crucial habitat for an endangered type of Columbia River steelhead trout, as this is one of the only places they spawn. The hunting section is very close to the walking section in this refuge. Although we couldn’t see hunting, we could certainly hear it. And the hunters have to hike back in with their bags full of dead birds right past the wildlife watchers. It made me sad. Where were the birds? There were some ducks, but they were pretty far away – so far you couldn’t even see what kind they were. And not anywhere near the numbers of ducks that I have seen at other refuges. There’s no car tour route – so you have to walk. That’s not a problem for us, but could be for others. 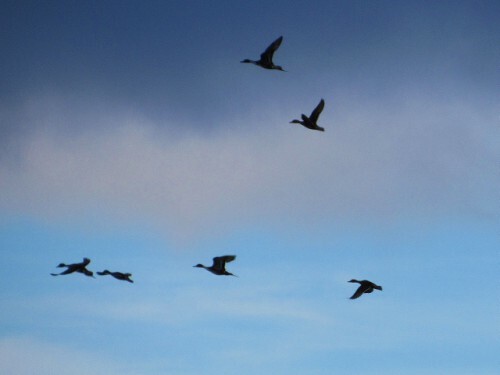 Ducks Fly Overhead – This was as close as we got. I did startle a Ring-necked Pheasant out of the bush while we were walking. I wasn’t quick enough to get a picture as he flew away. He was neat to see; we don’t have many pheasants west of the mountains. 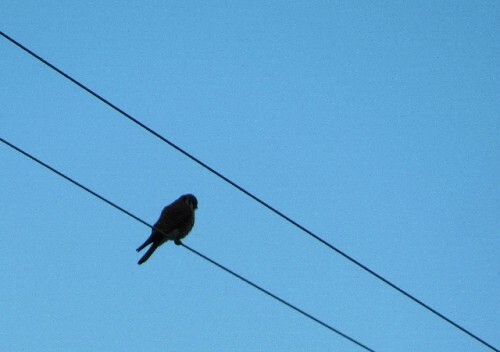 We also saw a falcon up on a power line as we were leaving the refuge. He was kind of far away but small, so my best guess is that he was an American Kestrel. I think this is an American Kestrel – he wasn’t very close. I’m not sure if we just picked a bad time of year for Toppenish. The other refuges we have visited have had lots of birds in the winter. Eastern Washington typically gets quite a bit of snow, but there wasn’t much this year, and the temperatures were in the 40s the day we were there. I wasn’t as impressed as I have been with the other refuges we have been to. But Jon liked it, and I would certainly give it another chance, because I’m just that kind of girl. Have you ever been to Toppenish National Wildlife Refuge? What did you think? A Spot Of Tea With Your Fill Up? 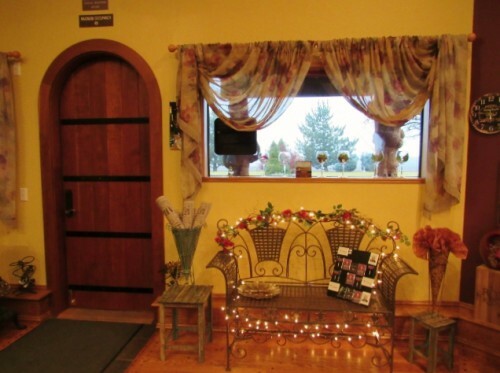 On our trip to Yakima, it wasn’t all beer and searching for wine. We also had a chance to finally visit a piece of Americana that I have been wanting to see for years. My friend Sarah at The Practical Historian (sorry Sarah, no brochure) will appreciate this one! The Teapot Dome Service Station. The Teapot Dome Service Station was built in 1922, in protest of the Teapot Dome Scandal that was being investigated in Congress at the time. I’m sure you have all heard of the Teapot Dome Scandal, but do you really know what it was all about? In the early 20th century, the Navy converted its main power source from coal to oil fuel, and several oil fields were placed under Naval control to ensure that there would be sufficient supply for Naval operations. One such field was the Teapot Dome Oil Field in Wyoming. Others were in California. All was going swimmingly until US Secretary of the Interior, Albert Bacon Fall, convinced President Harding to transfer control over the oil fields to the Department of the Interior from the Navy (ownership remained with the Navy). Once Fall was in control of the fields, he quickly leased the Teapot Dome Oil Field and the two in California to private oil companies at very low rates without putting them out for competitive bidding. Contrary to what you might be thinking, it was determined that the leases were legal. Fall indicated that he did not put the leases out for competitive bidding in the interest of National Security – because the fields were owned by the Navy, a competitive bidding process would have garnered publicity that would have jeopardized national security. I’m not sure I buy that argument, but apparently Congress did. The problem lay in the fact that Fall accepted money from the oil companies he leased the land to. A lot of money. He covered his tracks fairly well as the money changed hands, and the investigation fumbled along for a couple of years, with Fall covering more tracks as he went. Let’s just say some documents disappeared (this is probably where the execs from Enron learned their tricks…). But ultimately, Albert Fall couldn’t hide the fact that his standard of living had abruptly increased. Let that be a lesson – people notice if you suddenly and inexplicably become a multi-millionaire and start living high on the hog… Fall ended up serving 1 year in prison after his convictions for conspiracy and accepting bribes, and the leases were ultimately invalidated. 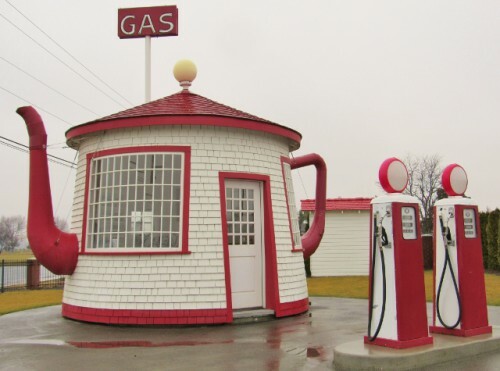 Jack Ainsworth, in tiny, little Zillah, Washington followed the news on the scandal and decided to make a statement – in the form of a 15 foot tall teapot shaped service station with the spout and handle made from sheet metal. It was operated as a service station for many years, and eventually had to be moved for the construction of the freeway in 1978. By then, it had earned its place in the hearts of the residents of Zillah, and was moved 1.2 miles to its current location. After our overwhelming wine tasting fail, we took a rambling drive though the countryside to Bale Breaker Brewery – which was happily open. It was about 3:30 in the afternoon and there were about 4 other groups of people drinking beer. I ordered the sampler, and Jon ordered an IPA. High Camp Winter Warmer – Malty and hoppy, with a light spice. It was made with Cascade, Centennial and Mosaic Hops. Kiln Series #003 – Imperial IPA – This beer had a slight bitterness on the roof of my mouth and back of my throat. It was not as hoppy at the Topcutter IPA. Field 41 Pale Ale – This beer has crisp flavors of grapefruit, with bitter hops. It is made with Simcoe and Ahtanum hops, and is named for the field planted right next to the brewery. Topcutter IPA – This very hoppy beer is made from Simcoe, Ahtanum, Citra and Mosaic hops. It is named after the machine that removes the hops vines from the trellis they grow on. My Bale Breaker beer sampler. 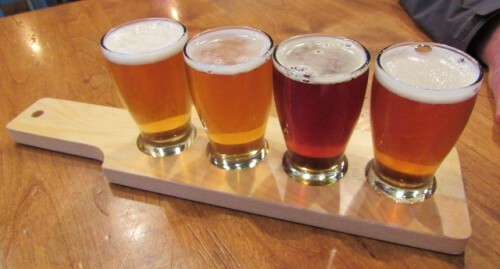 L to R: Field 41 Pale Ale, Topcutter IPA, High Camp Winter Warmer, Kiln Series #003 Imperial Ale. I enjoyed the beers, but they were all very hoppy (that’s definitely the trend lately, at least in Washington beer), and I would have liked them better if there were a couple that weren’t quite as bitter. 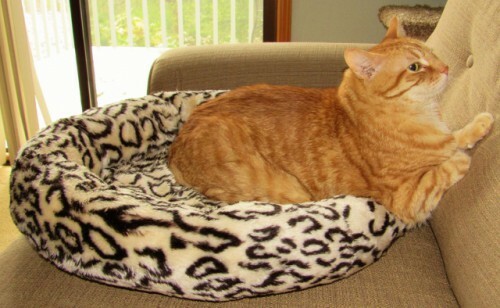 Oh well – it was worth it because Jon really liked his. It was nice just to be able to sit and relax and enjoy a beverage. They had some good music playing and the brewery was dog friendly; I would certainly go back again. But if the folks at Bale Breaker are reading this, maybe you could brew an Amber Ale? Yakima Craft Brewing has been around since 2007, with their first batch of beer in 2008. I have had their beer before and I knew they had an Amber Ale. Plus, we were getting hungry by the time we left Bale Breaker after 5 pm, and the Yakima Craft tasting room in downtown Yakima has food too. We headed back into town to check it out. We had to circle the block a couple of times to actually find the tasting room, because it is a little hidden (a narrow storefront in a big block) and then finding parking was more difficult than I thought it would be. But eventually we made it and settled in. I ordered a 1982 Amber Ale (delicious as always) and Jon got a Bad Monk. We both had bison burgers. I really wanted to love my burger, but unfortunately, it was a little overcooked. Not terrible, but not as good as a local, grass fed bison burger should be. We chatted and people watched, and the place filled up after a little while. My only gripe was they need more solid tables; ours was pretty wobbly. That said, I liked the atmosphere and will go back again. So, that was our day in Yakima. At least we ended on a good note! No new dead mice in the crawl space!